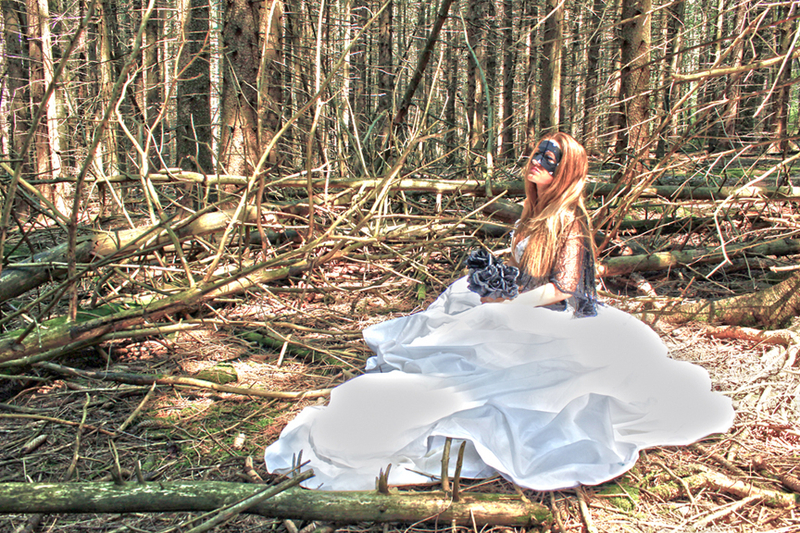 Title: Cinderella Takes A Moment – (Photography-Photoshop C.S.6- Digital Art-Canon EOS T3i) Location: Highland Forrest-Fabius NY. DESCRIPTION: I wanted to create a photo that conveyed an aesthetic sense of irony as well as a loud contrast between the sharp edges that life can put in our path. I've always been someone who recognizes the balance or imbalance regarding the contrasts that visually take place in our lives. We experience an infinite amount of scenery throughout our days. Our circumstances and environments provide a backdrop to these scenes. They create the moods that we live in. We never experience all joy or all pain. Most of the time we encounter a mixture of the both. It's what we take from these situations that define our attitudes and our perceptions. In this photograph, my modern day Cinderella has carved out a space between the thickets of her circumstance, and has found a place of peace for at least a moment. The forest although filled with light, is also filled with threat. I wanted to create an image of peace existing amongst that threat. My goal was to show that we all have a choice while dealing with the threats in our lives. We can either choose to find the peace in them, or allow our fear to take precedent.